We re-blog below Dr Brodie Waddell’s post on The Many- Headed Monster, September 8, 2015. The Many-Headed Monster can be found at https://manyheadedmonster.wordpress.com/ where you can join the discussion. Over the last two decades, the number of new PhDs in history has grown much faster than the number of new undergraduate students or the number of academic staff in the UK. That’s my main finding from far-too-many hours spent rooting through old spreadsheets. 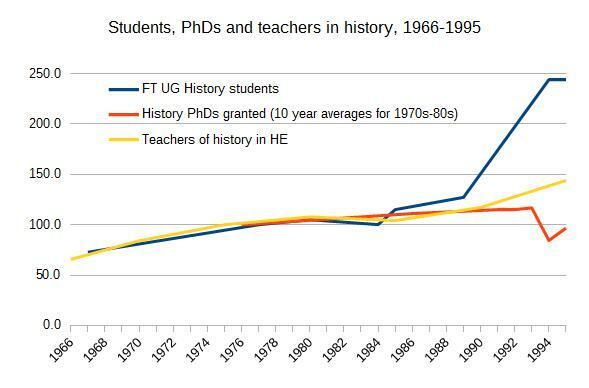 Last week, I published a post with some rough and very rudimentary analysis of the number of PhDs compared to the number of undergrads in ‘historyish’ fields. 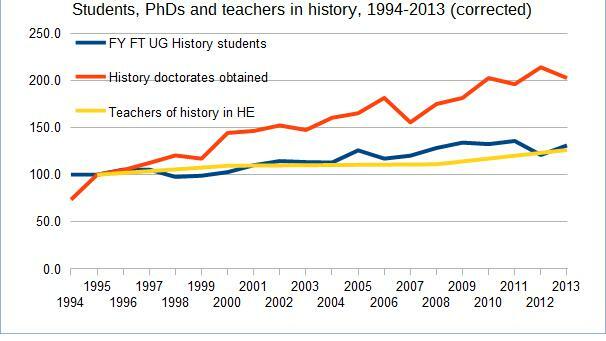 My conclusion was that the ‘supply’ of PhDs was rising faster than the ‘demand’. Since then, thanks to feedback from a wide range of commenters on the blog and on twitter, and thanks especially to Rachel Stone for alerting me to some additional data from the Institute for Historical Research, I’ve been able to refine and extend my conclusions. Although the depressing headline is roughly the same, I thought it would be helpful to set out what I’ve found. The most solid and consistent figures begin in 1995/96, when we have numbers for first-year full-time undergraduates studying history (6,123), doctorates obtained in history (239), and teachers of history in higher education (2,665). We then have figures right through to 2013/14, when there were 12,615 of the same undergrads, 625 PhDs, and 3,366 teachers. When we index all these numbers to 100 in 1995/96, this suggests the number of undergrads has risen by 106%, PhDs by 162%, and teachers by only 26%. However, as you can see on the chart above, there was apparently a huge jump in undergrads (63%) and PhDs (34%) in 2002/03. This seems to have been caused by a change in the way HESA categorizes different subjects, rather than an actual change in student numbers. There was only a five percent increase in the number of ‘theses in history’ as measured by the IHR and a four percent increase in the number of non-subject-specific student numbers listed by HESA. So, in order to account for that, I’ve ‘corrected’ all of the pre-2002 student and PhD data by applying a multiplier which reduces the large ‘artificial’ jump in that year to only four percent. The ‘corrected’ numbers are less dramatic than the ‘uncorrected’ ones, but still worrying. Here, the number of undergrads has risen by 31%, only slightly more than the number of teachers, whereas PhDs have risen by 103%. The precise shifts in the balance between undergrads, teachers and PhDs is unknowable thanks to changes in categorization and data collection. Nonetheless, several points emerge. The number of people teaching history has not been swamped by the growth in undergraduate students. There is no strong evidence for a dramatically worsening staff to student ratio, once the ‘correction’ in 2001-02 has been included. This was a surprise to me, so perhaps I’m misinterpreting something, but the conventional wisdom of ever-growing class sizes doesn’t seem to hold. However, the number of new history PhDs minted each year far exceeds the slowly rising numbers of undergraduates and staff. This means that the ‘supply’ of PhDs is much larger than the ‘demand’, and this gap is probably growing worse every year as previous cohorts remain on the job market after graduation. There were 625 PhDs granted in history in 2013-14, but only 3,366 staff, so unless one in five university historians are retiring every year, most of those new PhDs will not obtain a permanent post. What about the ‘quality’ of the jobs available? One of the main concerns of current early career historians is ‘casualisation’ through the apparent rise of fixed-term, part-time or hourly-paid posts. As someone who has only just escaped from a fixed-term contract, this is something I’m very aware of, so I decided to see if I could find any numbers that show whether this was a trend. Unfortunately, I was not able to find any specific to the subject of history, but I did find a few on university teaching in general. The HESA has been collecting data on ‘open’/’permanent’, ‘fixed-term’/’temporary’ and ‘other’/’atypical’ academic contracts since 1995. Unfortunately, it only has the numbers for 2008-13 online, but several years ago the University and College Union published an analysis of the HESA numbers for 1995-2005. In theory, the numbers from each source may be comparable, because the definition of ‘other’ used 1995-2002 (‘staff employed on an hourly paid or otherwise casual basis’) could overlap with ‘atypical’ used 2008-13 (‘working arrangements are not permanent, involve complex employment relationships and/or involve work away from the supervision of the normal work provider’). However, I suspect that ‘atypical’ is actually a much wider category, so they may not be comparable after all. Still, at least these two sets of figures give us a sense of the rough proportions and can be used for comparisons within the two periods. Broadly speaking, I found surprisingly little change in the proportion of academics on temporary contracts within each period. The proportion ranged from 42% to 45% in 1995-2004 and from 53% to 56% in 2008-13. In neither period was there a noticeable trend towards more insecure contracts. As noted above, the substantial rise in insecure contracts between 2004 and 2008 may be partly real, but it is probably largely the result of changing definitions. Further analysis of the HESA numbers for the intervening years (which are not online) is needed before drawing any firm conclusions. For now, I will simply say that the proportion of academics on insecure contracts does not appear to have changed significantly over the last six years. 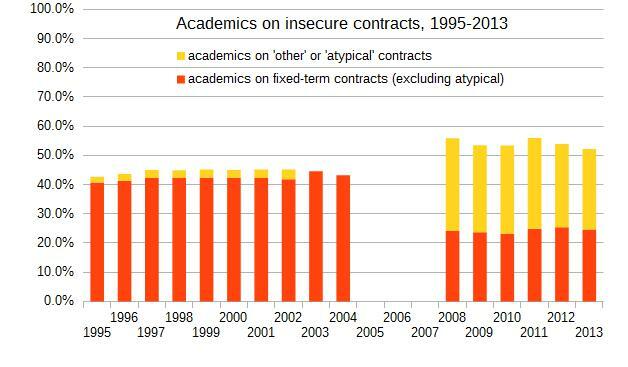 Whatever the trends over time, currently over half of all academics are on insecure contracts, a proportion that I believe is much higher than necessary. Moreover, the figures here do not distinguish between, for example, a well-paid full-time three-year lectureship and a poorly-paid part-time nine-month teaching fellowship. The latter may well be becoming more common. If anyone is willing, it would be very illuminating to track adverts for history teachers on jobs.ac.uk over the next year to gauge the type of posts available. Although the wider story of academic history teaching in the twentieth century has already been neatly summarized by Alan Booth, the basic figures are nonetheless interesting. 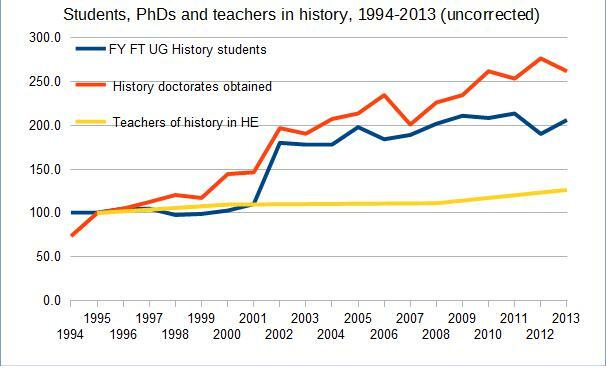 Over the longer term, the number of students, PhDs and teachers in history have all risen substantially, with especially strong growth in the number of undergraduates. The data before 1995 are much less consistent and reliable than the more recent HESA numbers, but the IHR has scattered figures going back as far as 1921. We can see major growth in staff and students in the 1960s, when many new universities were founded, though there are no usable numbers for PhDs. From the 1970s, the IHR have figures for all three groups. In the mid-1970s, there were 7489 undergraduates in history, approximately 450 PhDs granted, and 1,851 teachers. There was clear growth in the late 1970s, but in the early 1980s the number of undergrads and teachers both contracted, thanks mostly to funding cuts and hiring freezes. This was only a temporary setback because by c.1990, there were still more students (9,525), PhDs (509) and teachers (2,168). Then, in the early 1990s, there was a massive increase in students and, to a lesser extent, teachers. This is partly due to changes in the sources of the figures (especially for students), yet it was probably caused primarily by the ‘new universities’ created since 1992. Many new historians seem to have been hired at this point, as the number of teachers rose by nearly 500 (23%) between 1990 and 1995. Perhaps this was the ‘golden age’ of hiring we’ve been searching for? I’m sure that each of your will draw slightly different conclusions from this, but here are a few that stood out for me. First, the very rapid and disproportionate growth in new PhDs in history since the mid-1990s needs to be more widely acknowledged. We all know the job market isn’t very good, but current historians need to speak frankly to any potential new doctoral students about this before taking them on, and current graduate students need to consider this carefully. This does not mean that only the independently wealthy should do PhDs in history, but it does mean that we all need to think harder about the value and use of a doctorate in history beyond a conventional university post. Can you recommend any resources on alternatives to the academy for historians? Second, we need much better monitoring of academic employment, especially at the subject level. The figures from HESA for the HE sector as a whole are potentially indicative, but far from conclusive. If we want to make informed decisions about education and employment, and if we want to ensure that all academics are treated fairly, we need to keep track of the number and quality of jobs in history. I hope that the IHR, HistoryUK, theRHS or the UCU will take this on, because it is not really a job for an individual amateur like me. Perhaps History Lab and History Lab Plus can canvass their members about this and push for it? Finally, I think it is safe to say that the study of history has expanded immensely since the 1960s, with major growth in every decade except perhaps the 1980s. I believe that society benefits from more people learning and teaching history, and by that measure, we have succeeded admirably. We must not be complacent about the worrisome trends described above, but neither should we ignore the fact that many more people are now able to study history than could in the past. I’m grateful to the many bloggers (and tweeters) whose discussion of the position of early career historians inspired and informed this post. They are listed at the bottom of my previous post. I’m even more grateful to those of you who pointed me to online data (Sharon Howard, Rachel Stone), crunched some numbers (Matthew Grant), spurred me to look into casualisation (Catherine Fletcher and others) or otherwise provided feedback. I’ve put all of the data for the figures and charts into a spreadsheet available here. Feel free to use any of it however you’d like, though an acknowledgement would be nice. Let me know if you spot any errors. ‘History’ v. ‘Historyish’: After some poking around, I was able to find ‘subject’ level data for undergraduates and doctorates on the HESA website. This means that the figures in this post are for specifically ‘history’ degrees rather than the broader ‘historyish’ category (‘humanities’ or ‘historical and philosophical studies’) used in the previous post. For ‘history’, I have used ‘history’ and ‘economic and social history’ to 2001 and ‘history by period’, ‘history by theme’, ‘history by area’ from 2002, when the categories change. ‘Teachers of history’: I was unable to find any figures from the HESA on for staff numbers by subject, so I have instead used the ‘teachers of history in HE’ figures from the IHR’s Teachers of History. I compared these to the staff figures from REA/REF gathered by Matthew Grant and this suggests that the IHR numbers are probably too high overall, but that the change between c.1995 and c.2014 is similar for both the IHR (26%) and Grant’s numbers (23%). PhDs obtained: For the 1995-2014 figures, I have used the HESA numbers, which I believe are the most accurate. The IHR also has figures for ‘theses in history’ stretching back much earlier, which I used for the long-term trends, but these seem less consistent and are missing for some recent years, so I have only used them when necessary. Also,Jonathan asked if perhaps there were an increasing number of people doing PhDs who were not aiming for academic jobs (e.g. retirees), thus easing the pressure on the job market. Unfortunately, this doesn’t seem to be the case. If anything, there has been a shift toward more full-time doctoral students in the last decade, though again better monitoring and more systematic investigation might reveal otherwise.